Come see us at Renegade Craft Fair in Chicago this weekend! Hello Windy City, we can’t wait to see you again! 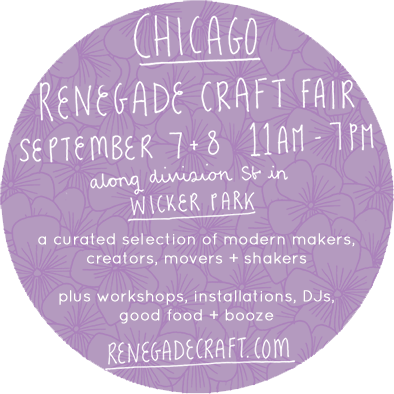 Join us and over 300 other best of the best, amazing Makers from around the country (and beyond) at the always superb Renegade Craft Fair – Chicago Edition this Saturday September 6th & Sunday September 7th in Wicker Park. Renegade Craft Fair is a bona fide not-to-be-missed show, hooray! It’s free to attend, with lots of family (and dog!) friendly fun too. We will be vending from Booth #30 on Division between Damen & Wolcott, with loads of our hand printed hand pulled silkscreen Art Prints, hand screen printed Rock Posters, hand pulled Alphabet Prints, Lunch Bags, Test Prints and more. So do come and say hello! 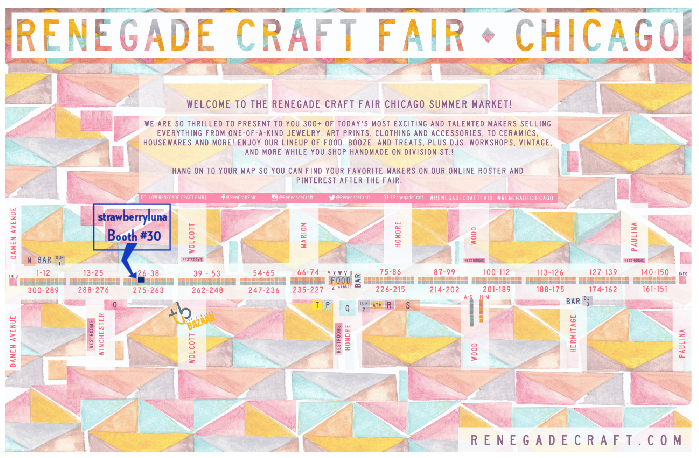 What: Renegade Craft Fair in Chicago, one of the largest curated gatherings of indie craft makers in the US. When: Saturday 9/6 and Sunday 9/7 from 11am – 6pm (both days). Where: In the Wicker Park neighborhood Chicago, IL between Damen & Paulina Avenue. Who: The best and the brightest of Handmade Makers in the US. For more info about the hands-on workshops, food & beverage vendors (including wine & beer), and entertainment click here. Below is a handy map of the Fair (click to enlarge) for you, and click here for a Vendor Listing as well. We’ll be hanging out at Booth 30, see you there! We are Crafty Bastards this weekend in DC! Yep, that’s right. We are Crafty Bastards! 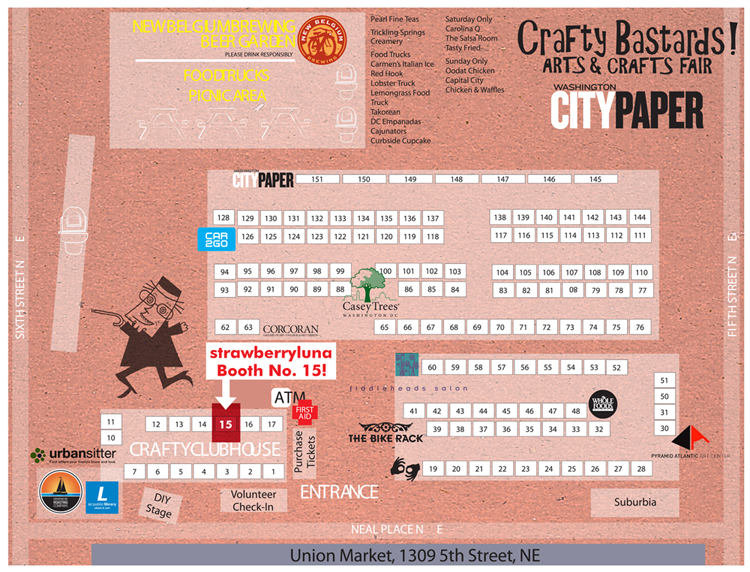 This coming weekend on Saturday September 28th & Sunday September 29th, 2013 we are so thrilled and honored to be a part of the amazing Crafty Bastards Arts & Crafts Fair in our nation’s capitol, Washington, DC at Union Market. This is the first year that Crafty Bastards is 2 days long and we will be there at Booth #15 for BOTH days, so we can’t wait to have double the fun. The Washington DC City Paper’s Crafty Bastards Fair will be held outdoors on Saturday, Sept. 28 and Sunday, Sept. 29, 2013 in the Union Market parking lot. Admission is $5 each day (ticket price subject to change). This show is a HUGE event and draws giant crowds to see the amazing set of the best of the best of handmade makers, crafters and artists from all around the US and beyond. Over 140+ vendors will be there, some on one day, others (like us) on both days. Check the vendor and scheduled list for info right here and a detailed map over here. We’ll be at Booth Number 15 for BOTH Saturday & Sunday, (see map below), so come on by! This is a ticketed and very busy show, now in its 10th year. Tickets are absolutely available for pre-sale here! Pre-sale 1-day passes are just $5, but with an equally amazing set of crafters coming on Sunday, make a weekend of it for $10 as both days will have different sets of artists and crafters! Where: Washington, DC at Union Market Union Market, located at 1309 5th Street NE and is accessible via the NoMa-Gallaudet University/New York Ave. station on Metro’s Red line. When: Crafty Bastards runs from 10am to 5pm on both Saturday & Sunday 9/28 and 9/29. For more information about the once-a-year and utterly fabulous Crafty Bastards visit their site here. For a larger version of the above map, just click on it, silly! Can’t wait to see you there DC! Hello Chicago Renegade Craft Fair! We’re back in the swing of craft & art show season things! And we couldn’t be more excited to be heading to Chicago, IL for the always amazing (and always free!) 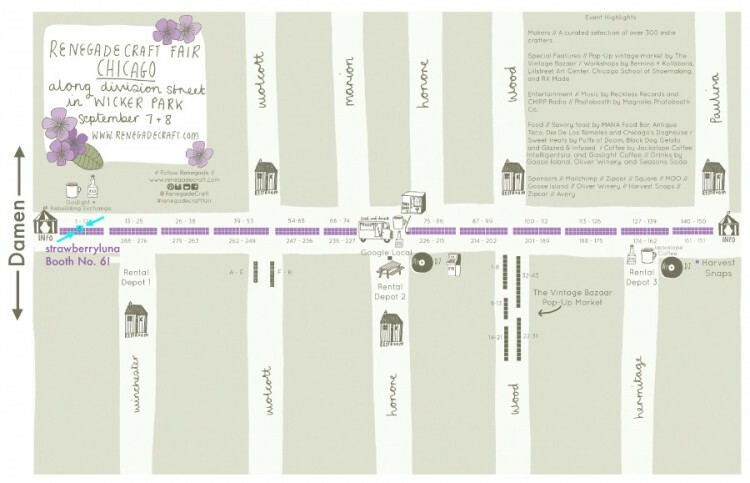 Renegade Craft Fair – Chicago edition, happening this Saturday & Sunday September 7th & 8th from 11am – to 7pm, both days. The Renegade Craft Fair brings together over 300 of the best of the best of handmade makers and artists from all corners, setting up booths to meet, greet, and sell our work to the lovely people of the Midwest. This event is HUGE and not to be missed! We will be there bright and early, and stayin’ late at Booth No. 6 (see our handy map below), so easy to find right near the corner of Division & Damen. Easy in, easy out. Come visit and say hello! 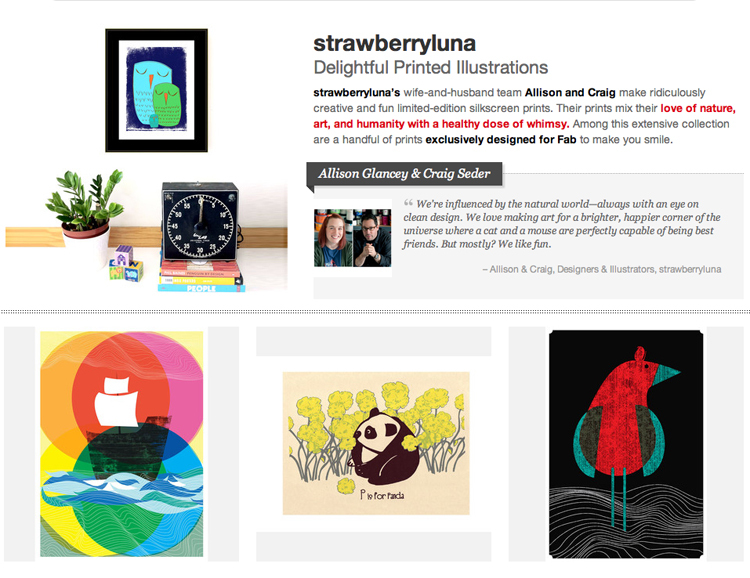 We will have lots of hand illustrated and hand screenprinted Art Prints, Rock Posters, Alphabet Prints, Lunch Bear Bags, new greeting cards and more! Can’t wait to see you this weekend Chicago! Entertainment // Music by Reckless Records and CHIRP Radio // Photobooth by Magnolia Photobooth Co.
Now that we are fully into the summer, it’s time to introduce our new sun-baked and semi-abstract, small art print, “Poppies”. Bright, overlapping poppies waving together against a deep sun filled background. Two peas in a pod! Playing with imaginary nature and abstract shapes is something we love to do. Every now and again a quick experimental sketch becomes something worth playing with further. This art print is based off of the illustration for our new Andrew Bird and Death Cab For Cutie poster, which you can see here. 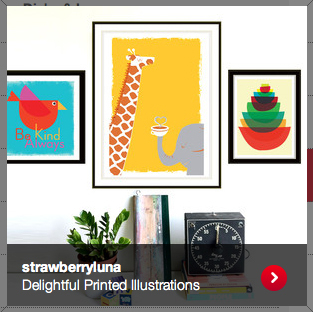 of an original illustration by strawberryluna. Each print is hand titled and signed. Designed to be flexible and fit beautifully into an 11×14 sized frame with a matte, or you easily trim down the border area so that it can fit or 8.5 x 11 or 8×10 sized standard frame quite easily. Size: Paper size is 9.5 x 12.75 inches (24.13 cm x 32.4 cm). Image size measures 6.5 x 9.5 inches (16.5 cm x 24.1 cm). Click any of the above images for more info or to purchase. 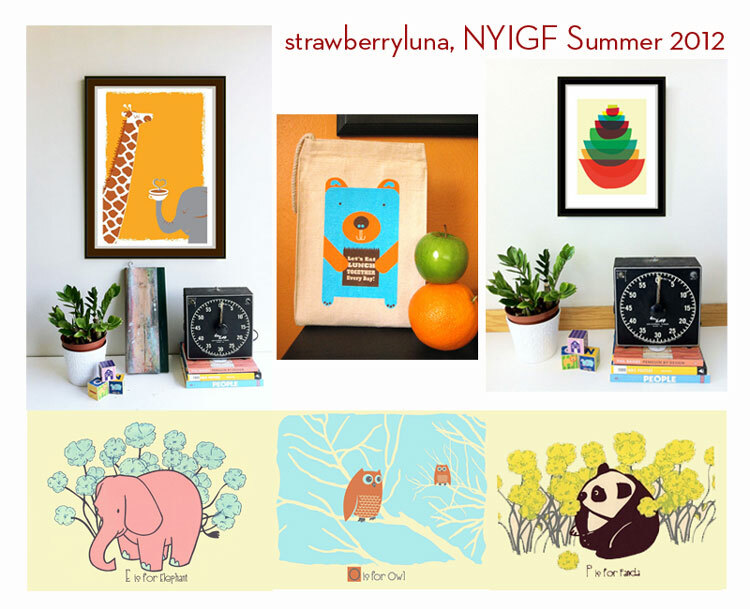 New strawberryluna Fab Sale starts Saturday June 30th! 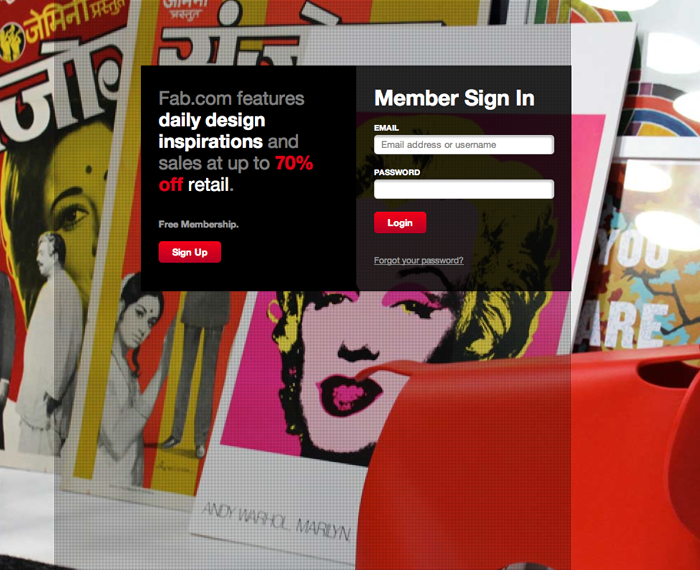 We’re thrilled to be working with our friends at Fab.com once again on our newest Fab Sale on June, 30, 2012. This sale, like all Fab Sales is exclusive to Fab.com, lasting just 72 quick hours with lots of great deals on our art prints and Alphabet Prints at anywhere from 20% – 40% off of every day retail prices that you won’t be able to take advantage of anywhere else. If are already a member of Fab you can check out our preview here. If you have yet to snap up a free, absolutely easy to sign up for, and spam free membership use this link to join Fab and get great deals on great design every day. Our Fab Sale starts on Saturday, June 30, 2012 at 11am (EST) and lasts just until Tuesday July 3, 2012 at 11am. That’s it. For Pitt. Don’t miss out! We are pleased as punch to be participating in the I Made It! 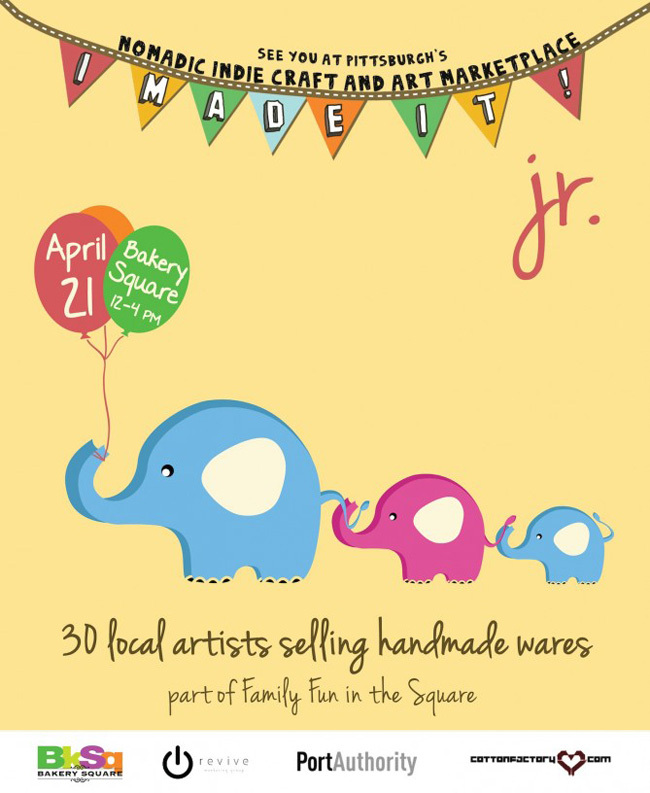 Market Jr., edition of Pittsburgh’s nomadic craft fair this Saturday April 21st at Bakery Square in East Liberty / Shadyside. It’s completely free to attend IMI! Jr., edition is only for one day! Don’t miss out on some super adorable small things for small folks. Who: Over 30 artisans will participate. Meet all of us here! When: This Saturday April 21st from Noon – 4pm. There is also complimentary craft beer for parents! WHAT?!?!?! + Lots of free games, activities and of course some crafting + the Animal Rescue League will be onsite with cute and cuddly kitties for adoption. View the IMI Jr,. artists here. And RSVP on Facebook for easy sharing with all of your friends!